Professor W. Albert Noyes, Jr.
First let me congratulate you on your choice as President-elect of the American Chemical Society. I contributed my bit by voting for you. 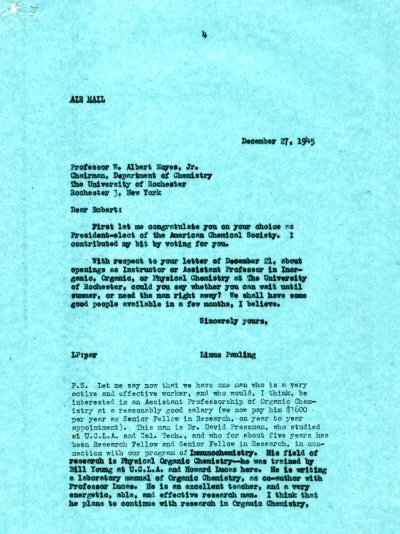 With respect to your letter of December 21, about openings as Instructor or Assistant Professor in Inorganic, Organic, or Physical Chemistry at The University of Rochester, could you say whether you can wait until summer, or need the man right away? We shall have some good people available in a few months, I believe.